At a “Pidyon Peter Chamor” event earlier this week, the Mekubal HaRav Dov Kook from Teveriya was in attendance. Rav Kook recited Kaddish, and then the donkey did something that caused Rav Kook to laugh during Kaddish. Previous articleILLEGAL Immigrant Suspected in FOUR Murders – Trump: We Need a Powerful Wall! Whats the big deal?? we have some guys in our shul who are always braying out “UUUUMeineeee” before the chazan has even finished the baracha….. It was just trying to say yehay shmay raboh. Oh come on you guys have no sense of humor! 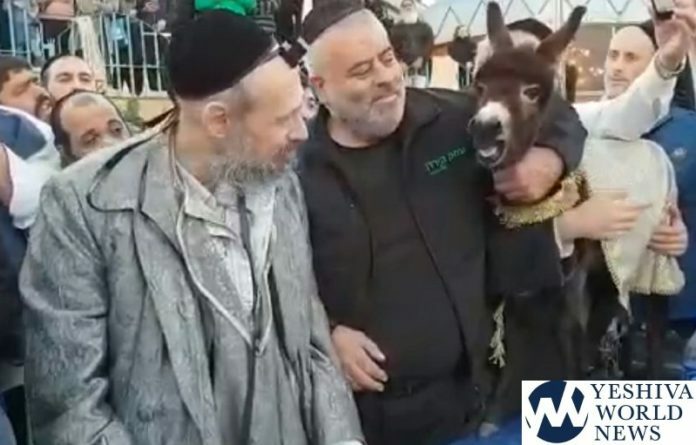 The donkey was saying Amain Yehay Shmay Rabbah! To add to meir G , It might have simply been reacting to the sudden ‘noise’ of the crowd. BTW, a question: do all MEKUBALIM use Carlebach for Kaddish?